This news story was published on April 5, 2019. FORT MADISON – Earlier Friday, a staff member became extremely ill after coming into contact with an unknown substance. The substance is believed to have come from a bottle of eye drops. Other staff at the institution quickly quarantined the substance, and the staff member was taken to the local hospital. Her condition has stabilized, and she has been released to recover at home. The substance that is suspected to have caused the staff member to become ill has been submitted to the State Crime Lab in Ankeny for testing by the Division of Criminal Investigations. Also Friday, the Iowa Board of Corrections voted unanimously in support of the appointment of Randy Gibbs as the next warden of the Iowa State Penitentiary (ISP). This appointment was recommended to the board by Interim Director Dan Craig. Gibbs will replace retiring warden Patti Wachtendorf on May 23, 2019. 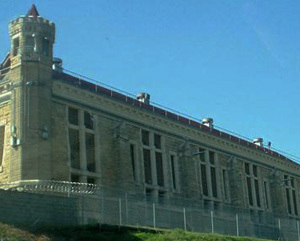 Gibbs, currently the warden of the Clarinda Correctional Facility (CCF), has served in his current capacity since May of 2017. He started his career with Iowa Corrections as a Correctional Officer at the Anamosa State Penitentiary in 1991. Throughout his career he has held such positions as: Lieutenant, Captain, Training Officer, Treatment Services Director, Associate Warden of Security, and Assistant Deputy Director of Institutional Operations. When Gibbs takes on the role of Warden at ISP, Stephen Weis, the Deputy Warden of the Clarinda Correctional Facility will take on the duty of Acting Warden at CCF. When you are guaranteed your job no matter how incompetent you are, why worry? Just cry to your union steward and wait, you’ll get your job back. Do you feel the same for the police officers who were hospitalized after coming in contact with fentanyl? Stay in the union and they will eventually force your job to go away. Don’t believe that? Ask Holcim, Deckers, The Brick Yards and many many more. Damn, these union people are terrible at their jobs. It’s always something with them. Last week, a Union man, a military vet, a husband and father, doing his job, put himself in harms way, to keep a mother and her young child from getting hurt. He lost his LIFE to a three time drunk driving the wrong way on a major expressway. The week before, a Union woman was doing her job, a routine traffic stop. Someone took her LIFE! No longer will her husband wait for her to come home after a shift. Yeah, it’s always something isn’t it? Your disdain for people is beyond contempt. Yet, I take pity on people like you who have zero compassion and understanding. The next time I need some wine, I’ll invite a union worker to over and have him/her change some water into a nice merlot, or a sauvignon blanc. I wonder how they are on walking on water. What’s the word? THUNDERBIRD! What’s the price? 40 TWICE! Ya, ya, ya, union workers can walk on water and raise the dead. Just too bad they don’t work for a living like the rest of us. Truth hurt??? That why you keep deleting my post??? I see nothing wrong with a group of employees getting together and negotiating terms of their employment. If it brings them better wages, working conditions, benefits, why not? Or are you the kind of person who will settle for what scraps an employer wants to toss your way? Long hours, minimum pay, no benefits, no protection from arbitrary or political dismissals. We see what that has brought about for average wage earners today. People who cannot afford their own homes, cannot buy new cars, cannot save for the future, who live paycheck to paycheck. Is that the dream you envision for the U.S.? It has already gone that direction since the 60’s, when one paycheck was able to sustain a household. Now, you need two or three per household to just survive. That has done wonders for society, for our community, now hasn’t it? You talk about wage earners today who can’t afford things. Live in homes you can afford, not big houses in the nicest part of town. How much was their cell phone and how much is there cell phone monthly bill? What kind of car do they drive, and do they have cable? I was always taught that when you got your paycheck, pay yourself first and force yourself to live off the rest. It isn’t easy, and it sure isn’t fun, but it is possible. Just live within your means. It’s really very simple. Oh yes, and be sure to cancel those credit cards. so…you saying it would not happen if they were not union?